Beautiful. Have a great Monday! Cute baby and a happy and proud mama! 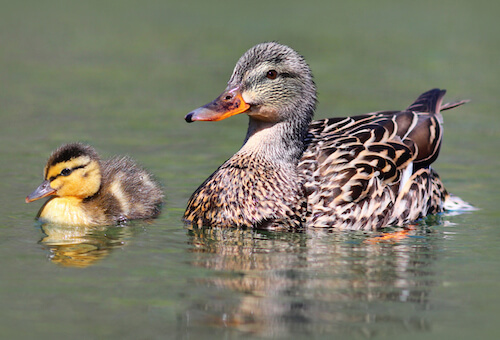 Just look at that proud Momma Duck with her cute baby. Sandee, you and Zane have a most wonderful day. Such a sweet photo. Bill and I have a fondness for ducks. Every Spring, a pair visits us, too. They are adorable. Thank you for offering a lot of sweetness and fun every week. You are wonderful. Big hugs. Good morning Sandee ( & Zane, sorry about forgetting you lately ). The duckies look so cute. See ya later my friends. Ducklings are so cute :-) Have a wonderful start to your week. Feathers are just as cute as fur. Awww! So cute! Baby ducks are adorable! Hope you had a wonderful holiday weekend, Sandee! This is a familiar scene. There has been an explosion of baby ducklings and pukekos near where I live recently. She doesn't have enough ducks for a row. Hi Sandee, very cute. Love the way they are mirroring each other. Mom and child. Another Awwwwww moment. This is really a great Awwww capture! I found you through Sparks and look forward to contributing some awwww-worthy posts!